Heard about Search, plus Your World yet? Google launched it last week. The short version is that when someone with a Google+ account performs a search while logged in, results drawn from content they or their friends have posted through Google+ will be a part of the results. Google has not provided a single universal search experience for a while, so the first of these three features is not as significant as it would seem. The second and third however are a different story. This is probably going to the most significant feature in terms of actual user adoption, and it is also in line with the steps that Google has been taking towards becoming a key identity provider online. Search is as much a destination in itself as it is a directory, and Google is close to filling the same role as portal sites like Yahoo! used to in the 1990’s. Adding the profiles to which the user is connected and those they might want to add to their Circles is an important piece of social functionality for Google+. On sites like Facebook and LinkedIn, the people search tools have been one of the tools driving the growth of their users’ networks. 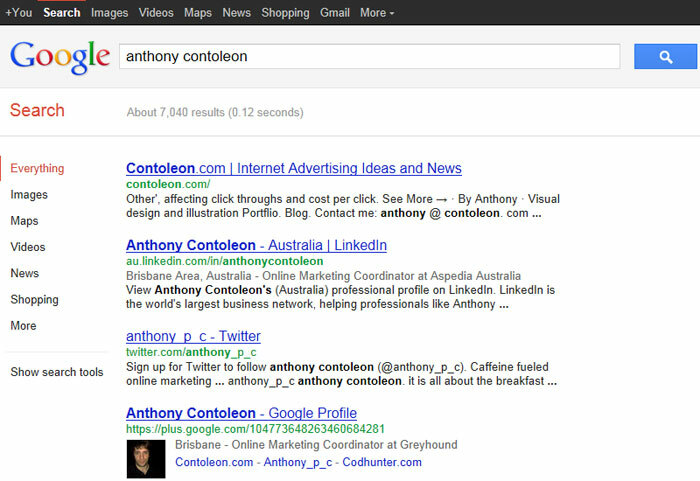 Making Google+ profiles more visible in the results and autocomplete also creates social proof for uncommitted users that Google+ is used, and I suspect will encourage people to use it more. The third feature being introduced with Google+’s closer integration with Google’s search results is the inclusion of personal profiles as results in search, outranking older, more active and ostensibly more linked-to web properties. The importance of personal Google+ profiles in search was hinted at earlier with Google’s replacing ‘+’ with quotations for marking a word as exact match. Considering how Google has used YouTube, Google Places and a number of other services within their search results, this should not have taken anyone by surprise. How well Google+ profiles are performing in search compared to other web properties has certainly drawn criticism, although not much astonishment, from the more cynical commentators online. There is a positive side to the performance of Google+ content in search, and that is in reputation management. It is another way to get content ranking for a brand or name that could outrank less than favourable results and bury them. The most interesting reaction to Google’s Search, plus Your World came from Twitter, who seemed understandably annoyed. Even though the two companies parted ways, Search, plus Your World became an opportunity for Twitter to state their concerns on how as a “result of Google’s changes, finding this information will be much harder for everyone” to find the breaking news and event information that Twitter has become known for. Google+ could become a competitor for Twitter as a realtime news provider and aggregator by displaying breaking information inline with organic search results, and it is interesting to see Twitter publicly take a shot at Google over this. However, it has been a while since their content agreement expired without renewal, leaving Google’s realtime search tools dead just as Google+ was being launched. With Search, plus Your World, it seems that Twitter is concerned that Google might be able to revive the functionality of realtime search, without having to enter another deal with their own social network. For Google+ to pay off for Google, it does not need to replace Facebook or Twitter. To succeed as an identity provider it just needs profiles, and for its users to remain logged in while using other Google products. The search results themselves are shaping up to be the most important part of Google+, with the addition of everything from friends, personal photos and shared content, to potentially realtime updates on subjects of interest (Remember Sparks? Maybe they will come into this at some point). Google+ is not about being a destination in itself, and frankly, it does not need to be.